It's been a long time coming but we choose NOT to put anything on our website until now regarding Brisan & Parker's memorial bench. For many it was their first time seeing the memorial bench (w/o Parker's name on it) at Parker's funeral. It was completed around the end of November as a surprise (we didn't except them to get it done so quickly.) but we choose to hold off publicly saying much due to an issue of “placement” at the cemetery. While we were waiting on those arrangements to have it moved, Parker's time had arrived and I sent out a dire email asking for assistance from the memorial company (not of their fault on original placement). It was previously placed on Parker's grave and in the early morning hours of January 23rd, I knew it had to be moved because it seemed evident we were getting close to Parker's homecoming. The cemetery had insisted on the original placement that it did't go “where it currently resides” because it wasn't on the plot map except we did own the spot in it's final position. It sits facing east towards Parker & Brisan, just west of them by only maybe a foot. It is literally right there. Near impossible really. We wanted something that stood out and could be a staple piece to remember our precious boys. You'll see 5 army men on the base of the seat. 2 on the left and 3 on the right “sneaking” up! Duncan had put 5 army men (1 for each of us) in Brisan's casket and we did the same for Parker. Brisan loved his best friend “PETE” and Charlie Brown. Parker has his favorite “Chewy” wrist band and Handy Manny! These were a couple favorite things that they enjoyed dearly. Under Brisan's name is “Bubbas” and for Parker, “Stinky”. Each of their nicknames. 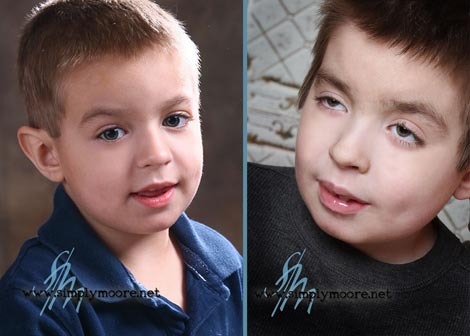 The picture in the middle is of Brisan and Parker taken August 2008. We were on the side lawn of our Grain Valley home at that time. We had just received the news of Brisan's diagnosis of Niemann-Pick Type C. We choose to leave the picture “as is”. Brisan is on the left and Parker on the right. We didn't feel it would be right to horizontally flip the picture around so they each were on their respective sides. Embed in the picture is each of their names by their feet so if you didn't know them… would know who is who. Orange was Brisan's favorite color and green was Parker's. The majority of the design is hand etched. Thank You to Johnson Granite Supply & YOU! TO EVERYONE THAT HELPED, THIS IS ALL POSSIBLE BECAUSE OF YOUR KIND DONATIONS AFTER BRISAN PASSED MARCH OF 2014! Tripp Johnson of Johnson Granite Supply was referred to us from Hank who helped guide us at the funeral home (Hank was amazing to say the least!). Tripp and his company made us feel warm and welcomed. They really invested time into us to not only extend their condolences but really wanted to deliver an awesome memorial bench. No words can really describe the generosity, time, and investment they made into us to help get this accomplished. 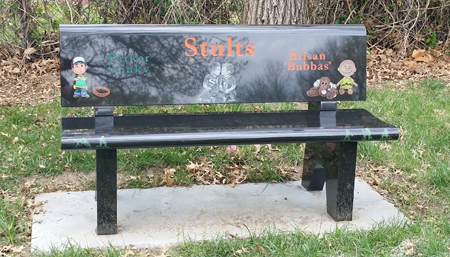 His staff including Kaylee & the artist planned out the design and carefully executed an awesome bench! It stands out like a million dollar car as you enter the cemetery. We would in a second trade it all in to have a few more days with them here on earth but… until we see you dudes again, we LOVE YOU! We just wanted to say thank you for everyones help and generosity!!! !